Xandria return with their seventh studio release 'Theater Of Dimensions'. It's an album that sees the band taking their music to a much higher level than ever before. Multiple choirs, new ethnic instruments and a full orchestra have all been used to flesh out the songs and their use has helped to round out and embolden Xandria's musicality to the nth degree. It's also the first full album that their new(ish) vocalist Dianne van Giersbergen has had full input with. 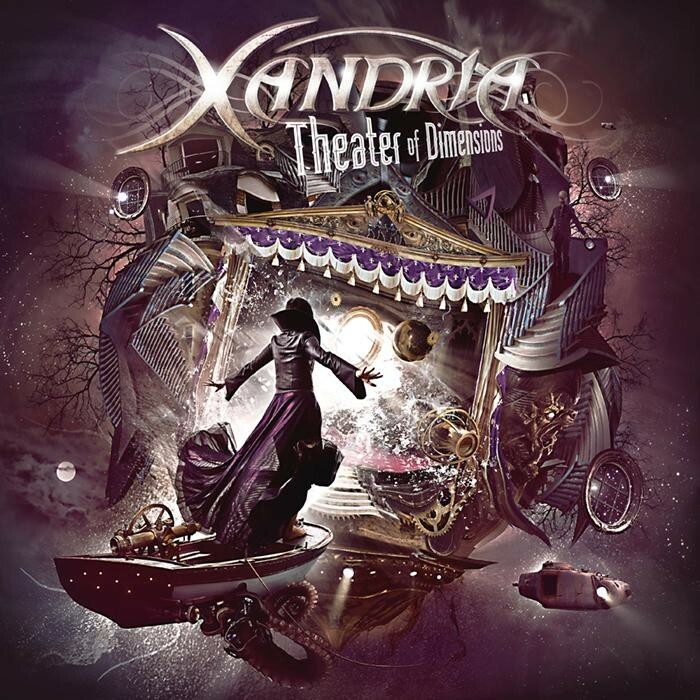 On this new release she is responsible for half of the album's lyrics and melodies and her inclusion in the song-writing process seems to have given Xandria new clout and muscle when it comes to constructing their songs. 'Where The Heart Is Home', the lead off track, builds slowly at first with Xandria joined by full orchestration and choirs, until the guitars of Philip Restemeier and Marco Heubaum link up with the powerful keyboards of Joost van den Broek to help take the song to it's cataclysmic conclusion. The riff-tastic, grandiose decadence of 'Death To The Holy'is a fast-paced and frenetic offering that shows the band in its best light and proves that they can take on the biggies of the genre and show them all how it's done. Other entries worthy of note include 'Call Of Destiny', the superb ballad 'Dark Night Of The Soul', where van Giersbergen puts in a wonderful emotion-fuelled vocal, and the dramatic and dark 'When The Walls Came Down (Heartache Was Born)' which is a song that sees Xandria trying to out epic Epica (if you see what I mean). The album comes to an end with the dramatic closing beauty that is the Operatic Fairy Tale 'A Theater Of Dimensions'; fourteen minutes of sweeping Symphonic splendour that's full of intelligent arrangements, killer vocals, forceful musicianship and hooks galore. To use a cliché, it is a real tour-de-force. Epica, Nightwish and Delain have had it their own way for quite a while, but there are a few bands who now have settled line-ups that can take on the big three and give them a reason to shake in their collective boots. Xandria and their new album are just such an act. This album is an absolute blinder, enough said.